One of our family’s favorite meals is an Asian-flavored Chicken Salad, that throw back to the nineties that was so very popular. It seems every restaurant had a version of an Asian Chicken Salad. And now, it seems like every restaurant still does. These are flavors that have found a place in our hearts. And a good Asian Composed Salad is not hard to make. Full of crunchy vegetables and tender chicken, the right dressing can make the dish just sing! A few weeks ago, I shared with you how to fry rice sticks. So fun! Since I like to keep a bag or two of Asian Chicken in the freezer, it’s pretty easy to pull together some rendition of this salad. Mixing up a good dressing takes only a matter of minutes. This last time I experimented with a premade teriyaki sauce and doctored it up with a few other Asian ingredients. If you don’t have a teriyaki sauce on hand, you can mix up this dressing instead. In a small mixing bowl whisk together all the ingredients. Serve with over Asian Chicken Salad. Disclosure: World Harbors has provided compensation for my time spent writing this post. All opinions are my own. I love the sound of that dressing! I make a few Asian salads, but none that look like this. YOur presentation is beautiful. 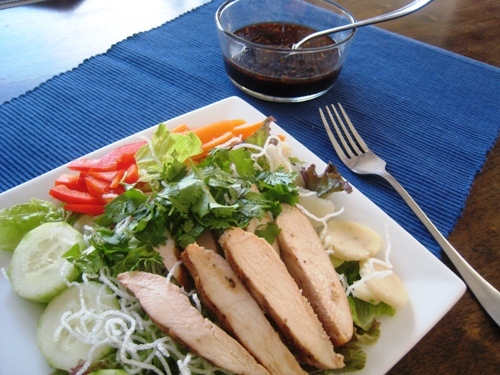 Your Asian salad dressing looks good! I just might have to try it out since I’m running low on dressing too. I linked up with some Tomato Pie. I’m totally bookmarking that dressing recipe. Thanks for sharing!! I linked up with my One-Dish Eggplant Parm — My husband has been requesting it every week! First time to link up to WOYP. Pretty late in the week(end) but just wanted to share what we had for lunch today. I hope to link up more in the following weeks. It will motivate me more to spice up our daily meals. By the way, I enjoy browsing through your blogs. Will definitely try your good cheap eats. Well it got me to stop and read it anyway, and it sure looks delish! Will have to try it!